Filled with fascinating and shocking case studies gathered over twenty years of investigative reporting, Narcomania exploded many of the myths and misconceptions about drug use. It made a compelling and ever-relevant case for a new way forward. 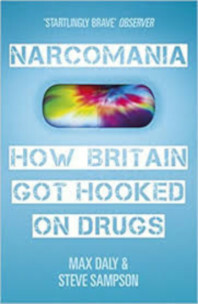 Looking at the dealers, the users, the police and the politicians, Narcomania charts how consumption and markets have fragmented and changed over the last decade; follows the money to reveal where Britain’s licit and illicit economies overlap; explains where each of the major recreational drugs comes from; and maps which drugs are popular in different parts of the country. It exploded many of the myths and misconceptions about drug use, and tapped into fraught debates about how politicians, parents and police should respond. Britain continues to sit at a crossroads in the legalisation-versus-intolerance debate. While other nations have succeeded with progressive experiments, inertia and self-contradiction define British drug policy to the detriment of everyone except the criminal underworld. Unsurprisingly, in the light of this book, our politicians are confused about what will please or displease the all-important middle class electorate. Equally unsurprisingly, however, so much myth and confusion surrounds the subject that clarity must be brought to chaos if the wisdom of the crowd is ever to surface…. First published by William Heinemann (Random House, UK) in 2012.